Every year, people around the world lose billions of dollars to investment fraud. As Albertans struggled in a poor economy, the need for fraud awareness was especially acute. So, for its annual Fraud Prevention Month education campaign, the Alberta Securities Commission (ASC) recognized that it needed a new approach beyond information sharing, something that would not only raise awareness of investment fraud, but also impact investing behaviour. Instead of an academic argument, the organisation knew that it needed to make an emotional connection with its audience. Firstly, research shows that being a victim of a scam is an embarrassing event, and not something those affected would want to share publicly. Secondly, even if the ASC did find a willing participant, there was a strong likelihood that it would fall on deaf ears. Telling Albertans would only take the organization so far. Showing them how easy it is to fall for a scam would better help drive home its message. “Optimism Bias” is a cognitive state and shows that people believe they are less at risk of experiencing a negative event like a scam versus other people. The idea was to show that it can literally happen to anyone, by creating an investment scam featuring a fictitious financier, investment firm and real estate investment seminar. The team developed a detailed fake profile for Maplestock Investments and Jonathan Fisher, including a website, Facebook page and LinkedIn profile. 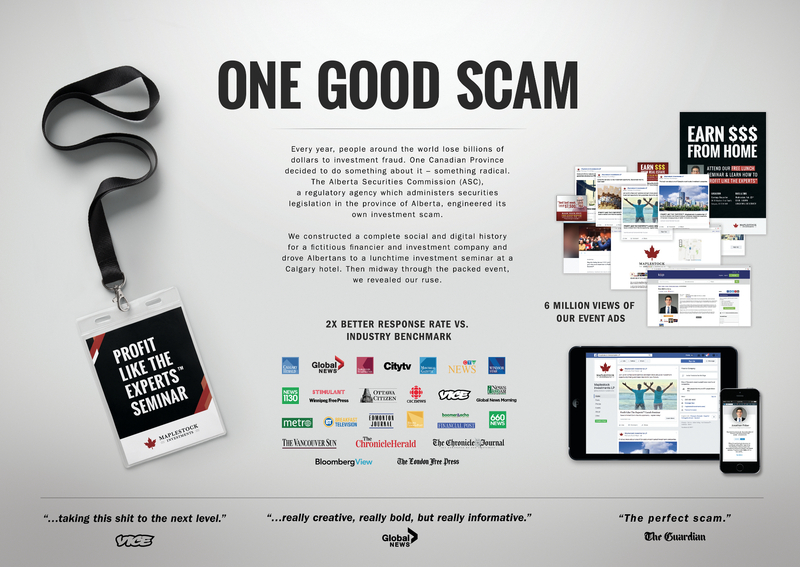 They then created ads using many of the red flags of investment fraud and advertised across numerous channels including Facebook, Google Display, Craigslist, Kijiji, and home delivered flyers, all leading to an Eventbrite evite for the seminar itself. Midway through the seminar, the ASC revealed the con. The seminar and story illustrated that investment fraud really can happen to anyone. The seminar was captured and the resulting video was sent to media along with fraud prevention information. Major Alberta media outlets were targeted across broadcast, print and online and achieved substantial pick-up. A PR issues plan and key messages were also created in the case of negative media reactions to the scam. The scam ads were viewed more than six million times and the team achieved two times the industry standard response rate. Website visits and page views quadrupled from the previous period. The campaign also generated more than 18 million impressions – 1,293% over the target benchmark. Social media engagements were 612% over the objective and video views of the campaign video were 1,674% more than projected with a small paid spend.